A key concept for life and death is almost filling the eye shape of a group, which means leaving one liberty inside the eye shape. 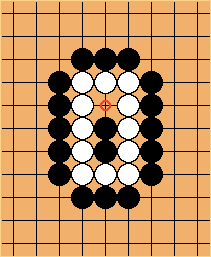 White's eye shape is almost filled with two stones. The circled point is the last liberty left inside the eye shape. It does not really matter whether the outside liberties are all filled or not. In this case they are, so White's group is in atari. 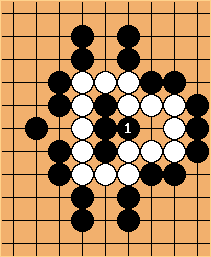 Here White has two outside liberties. The eye shape is still almost filled with two stones. If you manage to almost fill the eye shape of an enemy group with a killing shape and there is no escape for that group, it is dead. 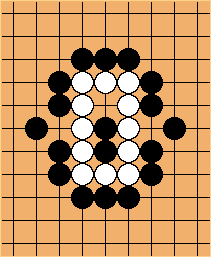 Instead of playing at any of the outside liberties, Black almost fills White's eye space with a killing shape, the farmer's hat. The term almost fill is used frequently throughout the explanations of life and death at Sensei's Libary.